Cayenne pepper takes its name from its supposed centre of origin - the Cayenne region of French Guiana, Cayenne deriving from a Tupi Indian name. It is now grown largely in India, East Africa, Mexico and the United States, in fact most tropical and sub-tropical regions. Chiles originated in South America, where they have been under cultivation since prehistoric times. The seed's long viability facilitated the rapid spread of the plant throughout the tropics and sub-tropics by the Spanish and Portuguese, the spice becoming as popular there as vine pepper. Chiles were long known as 'Indian' pepper - meaning 'of the New World' rather than 'of India'. Despite its specific name, and the supposed use of special chiles for it, there is little to distinguish cayenne from ordinary pure chilli powder, except that commercial 'chilli powder' usually contains other spices such as garlic or cumin, and is rougher in texture. 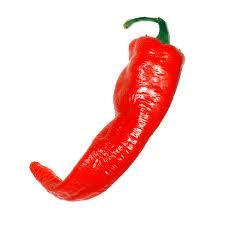 Cayenne pepper is a finely ground powder prepared from the seeds and pods of various types of chilli. The cayenne variety is commonly called 'Bird Chile', and the botanical name variously given as C. minimum or C. baccatum. As most powders are blends, the names of the varieties used are not very important. The capsicums used are the small-fruited varieties: thinnish tapered seed pods up to 12cm (5in) long and 2.5cm (1") in diameter. Cayenne is made from the ripened fruit, varying from red to yellow. The powder is red or red-brown in colour. Some cayennes include the ground seeds and are hotter than those which exclude them. Cayenne pepper is well known and easily available in the West. It should not be confused with the vine peppers which yield common black pepper. Bouquet: Dusty but slightly aromatic. Flavour: Hot, pungent and biting, although not as powerful as the hotter chillies. Thank you Ponderosa Pagan for your question and comment! I enjoy very much receiving comments and questions, so please feel free to comment away. Thank you soo much!!!! Im glad that I could spur the research for you and further educate all of us here in the land of blog!